Cosplayer Vanya Yount poses as General Hux from Star Wars: The Force Awakens before being judged for the NYCC Eastern Championships of Cosplay, where she won first place in the "Needlework" category. Cosplayer Philip Odango as The Sorcerer Supreme from 2016 blockbuster Doctor Strange backstage before being judged for the NYCC Eastern Championships of Cosplay, where he won second place in the "Needlework" category. Cosplayer Teegan Feehery as Tyrande from World of Warcraft backstage before the judging for the NYCC Eastern Championships of Cosplay, where she won first place in the "Armor" category. Cosplayer Adam Shefki as Immortan Joe from Mad Max: Fury Road alongside a fellow Mad Max cosplayer. This lovely Corpse Bride cosplay from Amanda Dawn will have Tim Burton fans saying, "I do!" Ciara Renée may not be a series regular as Hawkgirl on DC's Legends of Tomorrow anymore, but this classic Hawkgirl with her signature mace isn't messing around. We're keeping our eye on this creeper from the Resident Evil 2 video game. Watch out! This Green Arrow is aiming straight for our hearts with this classic green suit. Nothing to see here... just a couple of droogs nailing an adorable A Clockwork Orange cosplay. This is a powerful Spidey suit. And you know how the saying goes: "With great power, comes great responsibility." Holy cosplayers, Batman! We welcome any and all Dark Knight and the Boy Wonders. In other DC cosplaying news: these ladies play bad... well, good. This Vanellope von Schweetz look from Wreck-It Ralph is pretty sweet! Like mother like daughter! This Wednesday and Morticia duo are to die for, but where's Fester? The whole Cartoon Network gang is here, straight from the Land of Ooo! Me-ow! We're impressed by Catwoman's killer yoga skills. Just don't ask her to do a Downward Dog, okay? It's Christmas in July! Buddy and Jovie stopped down from the North Pole to sing a rendition of "Baby It's Cold Outside" in their freshest tights. This Jon Snow does know how to pull off a great cosplay, despite what the Ygritte next to him may be saying. It doesn't get more patriotic than this classy Wonder Woman look. You don't want to mess with this botanist! 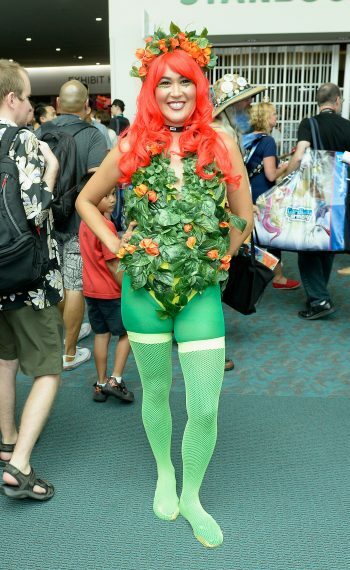 This DC villainess really brought the green out to SDCC. We're not sure which is scarier in this Game of Thrones cosplay... the spikes on that throne, or the daggers in Cersei's eyes. It's a jolly holiday with this Mary Poppins, who is decked out in her supercalifragilisticexpialidocious look. This flawless astronaut will take you to the moon and back. The grooviest gang in town! Shagadelic, baby, yeah! They ain't afraid of no ghosts! This Pac-Man couple is helping us believe in true love. The Star Wars power siblings are ready to save the world. These two Star Trek pals are giving off serious Leonard Nimoy-William Shatner vibes. Yaaaas Kween—or should we say Khaleesi? Either way, this Mother of Dragons cosplay is on point. Wait, these two get along? We just can't keep up with these two DC speedsters! Zootopia's bunny cop is ready to enforce the rules of Comic-Con. This pitch perfect Suicide Squad look will have all the good guys running. The Muppets' Beeker is looking a little lost without his boss, Dr. Bunsen Honeydew. This Walking Dead look has us ready for the next installment. Bring on the walkers! You don't want to mess with these Mr. Robot hackers. Comic Cons are a haven for fans—particularly fans who are into the art of cosplay. Really though, what better way is there to show your love for a TV show/movie/character/fandom than by walking around a major fan convention costumed in their honor? Check out TV Guide Magazine's four unique Comic-Con covers! In honor of San Diego Comic-Con, which is right around the corner, we rounded up photos of cosplayers that took on everything from Doctor Strange to Zootopia. Click through the gallery above for some of the best and most creative cosplay in attendance at both the San Diego and New York Comic-Cons in 2016.